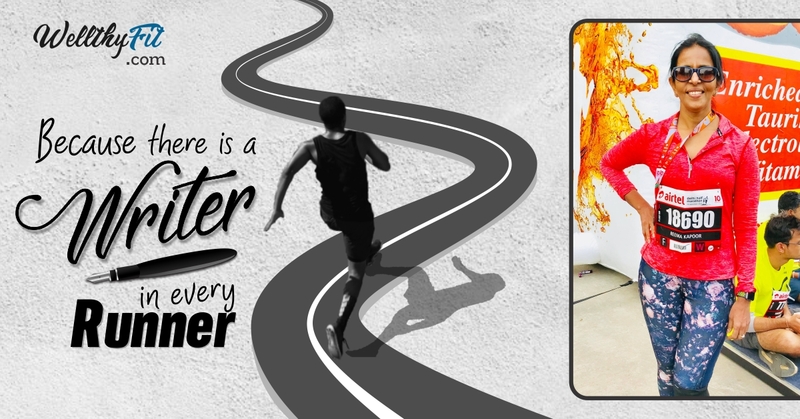 The Runner who is making a writing attempt here on WellthyFit is a 51 year old doctor and a Radiologist – Reema Kapoor. I have never met her, even though we live in the same city and run almost the same events. I read her write up a few times and realised that there is a Reema in everyone’s life. Your best friend, your mom, your mother-in-law, you sister….and they need to read this. Not every story must make heavens fall for us to feel the impact. Not every story has to stem from a tragedy for us to read it to the end. Simple acts and life changing attitudes are hugely underestimated in the times of breaking news. So here we are with Reema’s story From I can’t to I Will NOt Stop! I lead my life just like the saying “ If you love your job you will never be tired because you will be busy enjoying it”. But this is Year 2018. Let’s move back ten years when I was so busy with my career and my kids’ studies that I didn’t have any time for myself. I was 78 kgs and with a cervical collar and lots of unchecked health issues which had just started troubling me. People had started advising me to slow down and take life easy or I will burnout. I am really thankful to a few friends who advised me to join a group dance/ aerobics class. After that I lost a few pounds in few years and thought that this is it. This is fitness. My energy levels increased and I started setting new targets. Then I was introduced to CrossFit and I realised that I could challenge myself further. It opened up my mind basically and removed all kinds of blocks I had. Then my husband ,who was with me throughout my fitness journey, started running. I announced to my husband that Running was not my thing. I also told my husband that it was best if he did his own thing and left me to do mine. I didn’t feel good about saying all of this, obviously. Again that mental block about starting running at the age of 48 hit me. But my husband’s early morning escapades (I used to think like a typical wife) were getting very regular. So I just joined him to check out his group. It was then I realized that running was a different kind of sport. It was a challenge everyday no matter how good or new runner you are. Then started my running journey. Realized so many things I didn’t know I had in me. Realized that this is such a mental challenge. It requires more discipline than any other thing I have done till date. Today, after doing seven half marathons (I have turned 51 this July) and many 10 km runs, I feel sorted about my running and training ( at least I like to think so ). But believe me every run brings new challenges and there is a mind game which starts with my first step. From , “No Reema you can’t run this distance today make it short, be practical you have to go back to your clinic and work the whole day” to “Yes Reema , you can do it as always, be a little faster and prove it to yourself today only ,so that next time you have to do better than this. Go for your PB today only. This is the real joy of running. Challenging yourself daily”. Something funny happened when I turned 50. I started getting podium finishes frequently (six till now in 2018). This has hit a new hunger in me. From a person who used to advise her kids that you don’t have to top any exam as toppers have a very restrictive attitude towards life, NOW this Mom tried to monitor her running pace and started taking help from other experienced runners. I have wondered at myself and smiled too many times in the last few years. Now I know the meaning of recovery, Stretching and Yoga. The importance of warm ups and Nutrition. I now have a great group of friends where we all talk Running. On the whole it’s been a wonderful journey and I am sure it’s going to get better. Almost all life’s lessons can be learnt on your running track. It needs a lot of will power, grit determination and of course consistent hardwork. Yes !…..We are all so proud to be associated with Reema……kind of gives a high! “She is the motivation that i need now” ….i have been a fitness freak till i was in my forties and then suddenly the laziness struck in and i slowly left my routines and exercise …and then i let go of the walks too 🙁 I used to find a new excuse everyday not to exercise or go for that walk! But seeing Reema and seeing her journey inspires me and i have slowly gone back to the starting phase; and everyday still is a struggle but i guess this article might be a turning point …..Thank you Reema and thank you Tanya……may be this will finally turn the table …..i am keeping my fingers crossed!